Saturday last weekend I had the opportunity to regress into child hood for an evening. 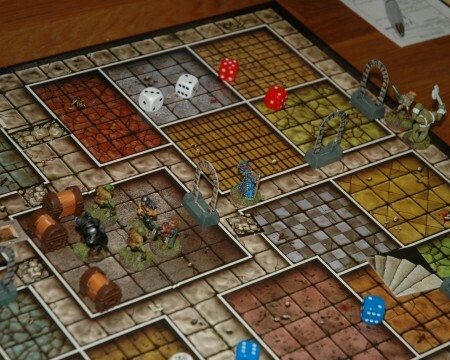 Some old mates came visiting, we had some good food and drinks and most importantly – we played Hero Quest! When this was decided I still didn’t have very many HQ models painted. Only two of the zombies, really. So, I went about to see what I had painted or near painted that could stand in for the models in the box. The four skeletons, the evil sorcerer and the four heroes were easy, I just picked them from my Stillburg project. For gobbos, I had the Iron Claw goblins I painted a few years ago. Three fully finished, but I needed six so I dug out three more from the same range and plopped a green stuff hat on one of them. The rest of the models needed were not even based and primed! That left me with the need for 4 chaos warriors, 3 fimir, 2 mummies, 1 gargoyle and 8 orcs. 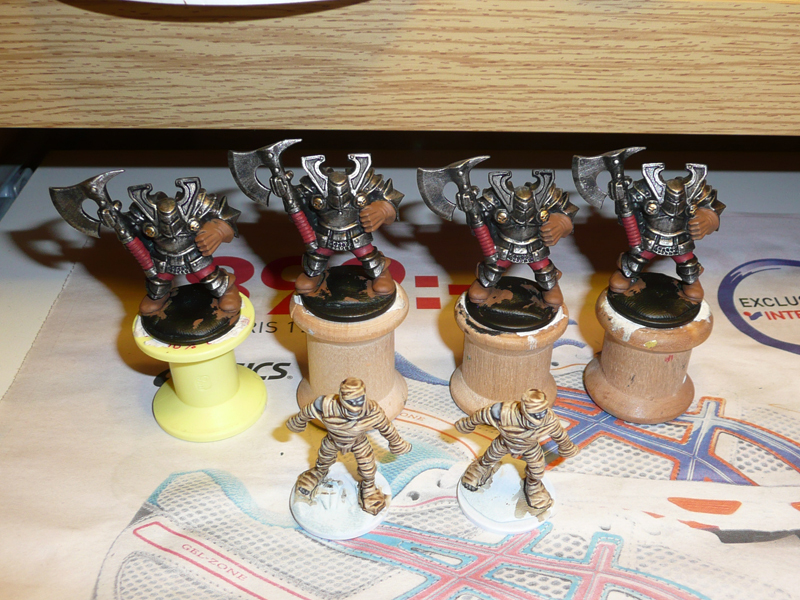 The orcs were nearly there, as I decided to use the Harboth’s orcs I had painted to near completion. I did them up first, as can be seen here. Next, I got started on the models I had to finish. 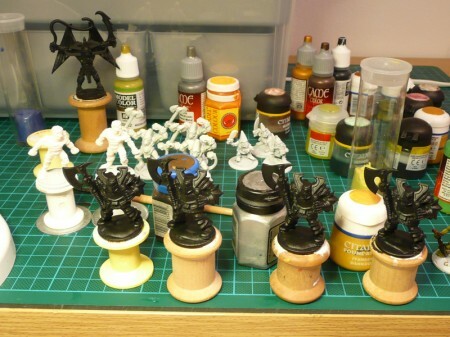 After cleaning, cutting, prepping and priming I was left with the below – and three days to finish them! 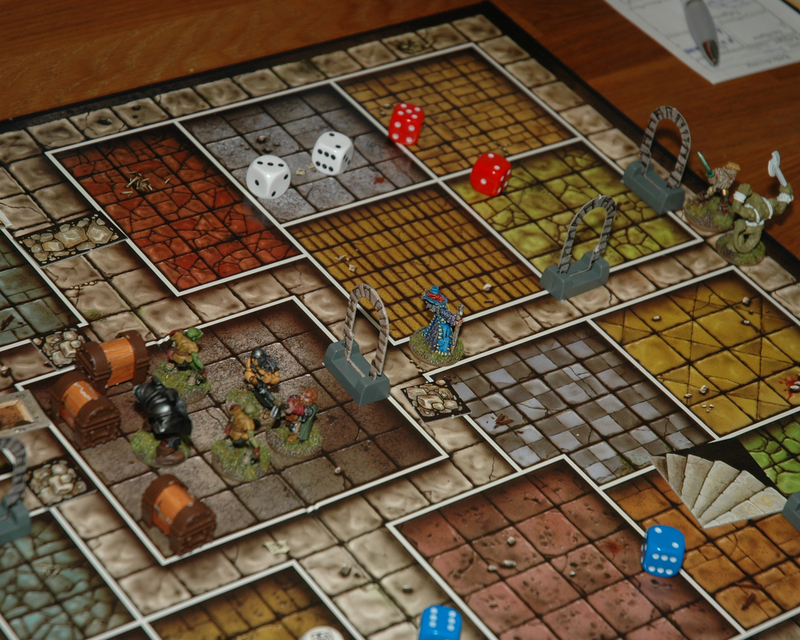 I decided to tackle the easiest models first, and in an evening I had these done to an acceptable table top level. The mummies are standard Hero Quest, while the chaos warriors are the 90s monopose plastic regiment warriors. Used them instead of the original warriors in order to save some time on the base cutting (I’m not keeping the integral bases). The next evening I actually didn’t paint anything (foolishly) – so I never managed to finish the goblins, fimir and gargoyle. They did come some way though. Even if I didn’t actually finish any more models I think I did a pretty good job for three days of work. In the Swedish translation the gargoyle is called “the horror mask”. It doesn’t make sense in Swedish either. And the full set of proxies and half-jobs. It didn’t really matter, as long as all the bases were finished (but I did miss the static grass on the mummies… curses!). We had a few great games, produced a rather eclectic playlist on Spotify and managed to squeeze in a few cigars. I had a fun night and so did my mates. 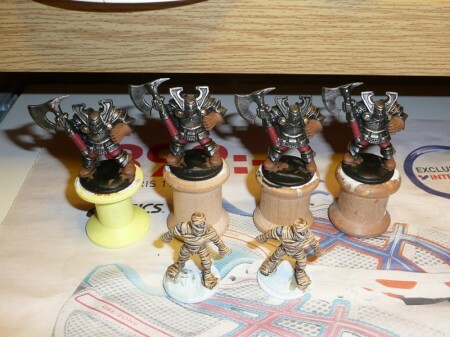 Now I’m well motivated to get the full set painted (including proper Chaos Warriors, I went for 4th edition plastics to avoid spending time cutting bases). 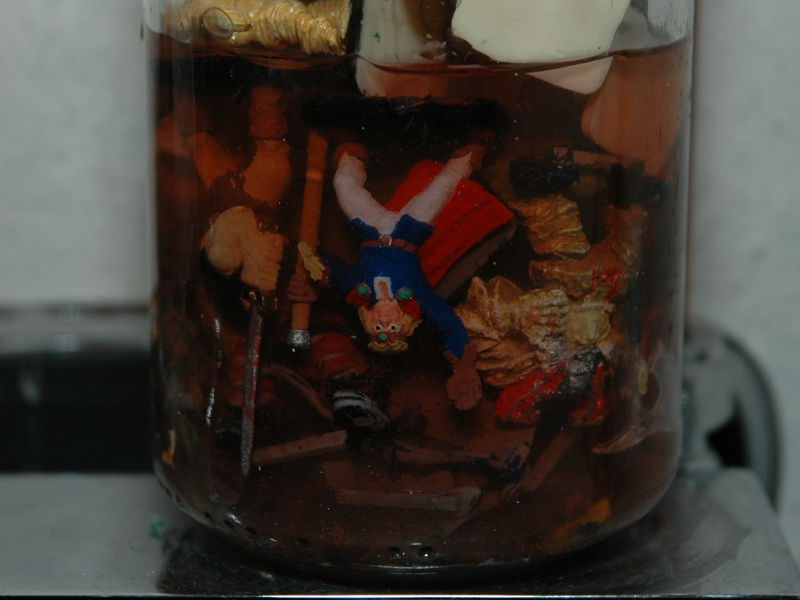 Thusly, my old paintjobs (as previously displayed) went into the stripping jar! Anyways, here’s what I’m aiming for. 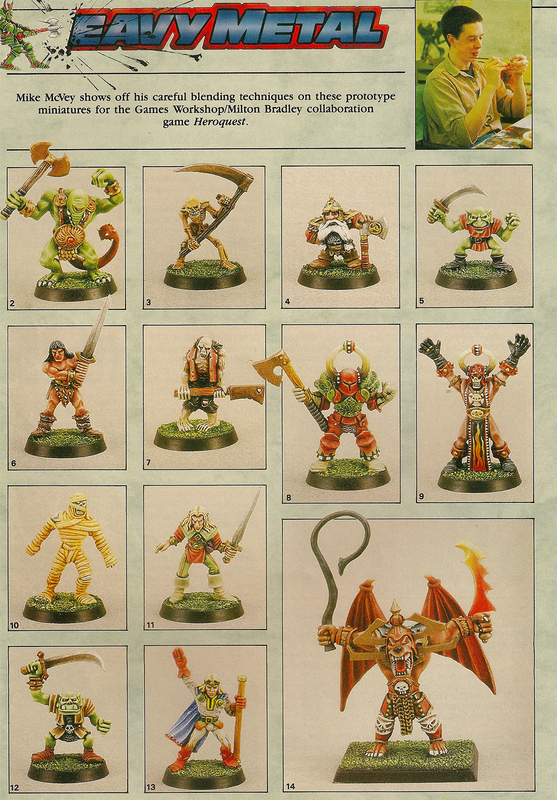 Mike McVey’s splendid rendition of the Hero Quest models (or well, metal prototypes) in White Dwarf #113. Magic Mike at his best. I learnt about HQ long after it’s been out of print and sadly never had any opportunity to play a single game. These old GW games were never popular in Poland or to be more specific – the hobby has “grown” here too late. It’s great to see the old miniatures painted. I even had one of these cool placcy chaos warriors! It came with Citadel fantasy paint set and it was probably my very first GW model. Thanks for bringing some happy memories. Poor bereft polish kids! =D Yeah, that warrior has been molested by a LOT of kids. I believe it was him and a space marine in the old basic paint set with hexagonal white flip-top lid bottles. Sadly my copy of HQ plus all the add-ons (and I had ’em all) are long gone. The simplicity of the game makes it increasingly attractive to my mind and I find myself perusing copies on the Ebay from time-to-time, although I like to think that Cavern Crawl strives somewhat towards such spartanism re. mechanics. You know what… I should help you out with that. We could sort a small compendium with 10-12 linked quests. A few new mechanics, monsters etc introduced in each. Focusing on a cheesy but coherent story line. Funnily enough I’ve found creating crawl maps for CC sessions increasingly tedious recently. A GM has to pretty dedicated to regularly turn out engaging quests for his group so pre-made adventures are certainly a good idea. I’m up for a collaboration if you are! Currently reading the Heroquest Novel – Fellowship of Four, which is pretty dire to be honest – but fun! Cheers mate, for the little amount of work put in the finished models look rather ok. The lot look good, plus its good to see you posting again. A finished Heroquest set is something that appeals, but a finished Space Crusade set appeals to me more. SotC is probably better, but I enjoy the 40K fluff a lot more than the Mutant Chronicles even dafter universe. SotC is a bigger screwfest, with some abilities that really are just waaay to harsh. If you like one Space Crusade then you will likely enjoy Siege of the Citadel, and vice versa. I also played my Space Crusade games on the Amiga 500, where a generation learned to kill dreadnoughts by tricking them into standing in doorways and then shutting the door (something that cant be done in the boardgame). I gave an unpainted set of Space Crusade a run out last year with a couple of buddies and it was surprisingly good, daft fun. I hope that you get the HQ set finished. Thats surely one that you might get junior to play at some future point. The HQ set will be finished, it’s just a question if it’s going to be this year or next really. I’m itching to finish the fimir, always loved those models. Also, we had fun playing – and kept the sheets. I’m anticipating another session in the not too distant future. Only downside was the rather small benefit of gathering gold. Not much to do with your newfound riches as most of the upgrades are rather pointless. Big whoop, I get to attack diagonally too.